You can never go wrong with a light and tasty Strawberry Shortcake like this one from Ricardo. 1. With the rack in the middle position, preheat the oven to 180°C (350°F). Line a 30 x 43-cm (12 x 17-inch) baking sheet with parchment paper, allowing the paper to overhang 2 opposite sides. Butter the paper. 2. In a small saucepan, melt the butter in the water. Let cool partially. 3. In a bowl, combine the flour, baking powder and salt. Set aside. 4. In another bowl, beat the eggs with the sugar and vanilla using an electric mixer until the mixture is thick and falls from the beaters in ribbons. With the mixer on low, add the dry ingredients, alternating with the butter mixture and the sour cream. 5. Spread the batter evenly over the baking sheet. Bake until lightly browned and a toothpick inserted in the centre comes out clean, about 25 minutes. Let cool partially. Unmould with the paper (to help keep the cake moist). Let cool on a rack. 6. Trim the edges of the cake to straighten them. Cut into 2 rectangles 30 cm (12 inches) on their longest side. 1. In a bowl, toss the strawberries with 30 ml (2 tablespoons) sugar and the Grand Marnier. Let macerate for about 15 minutes. 2. In another bowl, whip the cream with the remaining sugar until stiff peaks form. 1. Lay 1 cake rectangle on a rectangular serving plate, paper side up. Remove the paper. 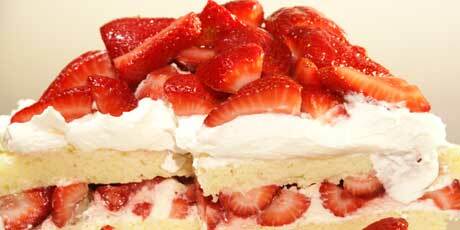 Top with half the whipped cream and strawberries. Cover with the second cake rectangle. Remove the paper. Top with the remaining whipped cream and strawberries. Serve immediately. 2. Note: You can make this cake with other berries, such as raspberries, blueberries, blackberries and ground cherries.